The MSI-6800 system was a bus structured system based on the SS50 bus developed by South West Technical Products (SWTPC) for the 6800 processor in 1975. All of the MSI boards were thus compatible with all existing SS50 circuit boards and interface cards. The main system had a 16-slot motherboard and was available ready-built or in kit form for some parts. It could support dual floppy disc drive (2 x 160 KB) which can be integrated into the main unit. It can also support a 76 MB hard disk unit. The minimum system was made of one CPU board, one interface board and one 8 KB RAM memory board. If an optional 6809 board was used, this can be expanded to 384 KB. I worked at MSI in 1977-79, and I still have a catalog of theirs. The price was $595 for a kit (contained chassis & hardware, power supply, mother board & connectors), CPU board & monitor, 8K RAM Memory Board, Interface Adapter Board, Serial Interface Board). $895 for a wired & tested system. We had two operating systems. One was co-written by Glenn Taylor and Ed Wells (who also wrote the last version of the Basic interpreter). The other was purchased/licensed from Software Dynamics. Robert Uiterwyk's BASIC Interpreter ran in FDOS, and SD-BASIC Compiler ran in SDOS. 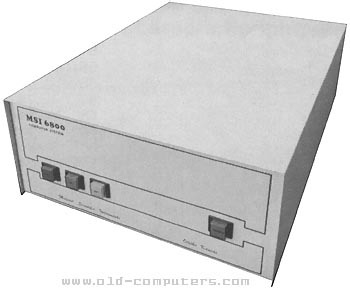 MSI also marketed business systems with 5MB and 10MB Winchester Hard Drives, starting in 1979. See the 'Advert' section for a full copy of the MSI 1978 catalog. see more MSI 6800 Ebay auctions !